Berlin Specimen. Image links to CRRO. RRC 427/2. 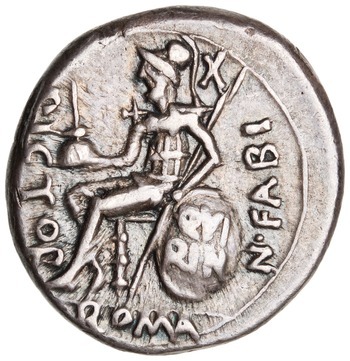 This is the typical numismatic image associated with Quirinus, but Hollstein (JNG 2011) has revived the opinion of Fulvius Ursinus (sometimes called Fulvio Orsini) that in fact RRC 268/1 is a representation of the god, not a recent ancestor of the moneyer who was a priest of the god. I find this convincing. It harmonizes well with Servius’ commentary on Aen. VI, 859 which describes Quirinus as the Mars who presides over peace. tertiaque arma patri suspendet capta quirino et tertia opima spolia suspendet patri, id est Iovi, ‘capta Quirino’, qualia et Quirinus ceperat, id est Romulus, de Acrone, rege Caeninensium, et ea Iovi Feretrio suspenderat. possumus et, quod est melius, secundum legem Numae hunc locum accipere, qui praecepit prima opima spolia Iovi Feretrio debere suspendi, quod iam Romulus fecerat; secunda Marti, quod Cossus fecit; tertia Quirino, quod fecit Marcellus. Quirinus autem est Mars, qui praeest paci et intra civitatem colitur: nam belli Mars extra civitatem templum habuit. ergo aut ‘suspendet patri’, id est Iovi: aut ‘suspendet patri Quirino’. varie de hoc loco tractant commentatores, Numae legis inmemores, cuius facit mentionem et Livius.